The NiO/ZnO hybrid nanoparticles were synthesized using sodium dodecyl sulfate (SDS) in a micro-emulsion method. The NiO/ZnO hybrid nanoparticles were characterized using X-ray diffraction, scanning electron microscopy, UV-visible absorption spectroscopy, infrared absorption spectroscopy and energy dispersive X-ray spectrum. 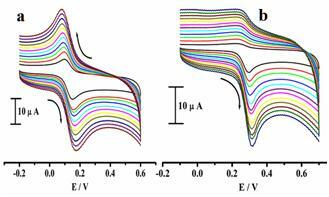 The obtained NiO/ZnO hybrid nanoparticles were used for the preparation of modified carbon paste electrode (MCPE) for electrochemical detection of dopamine and uric acid at physiological pH 7.4. The MCPE exhibits enhanced electrochemical parameters such as peak current response, surface area of electrode, electrocatalytic activity, diffusion-coefficient, lower detection limit, sensitivity and higher linear range. The proposed method was successfully applied for the detection of dopamine and uric acid in real samples.